Vikram pulled Betal down from the tamarind tree and started walking. Betal began a story. Once there was a prince who had two friends, Bansi and Gopi. Bansi was a soldier so he was appointed as the prince's guard. The three once happened to pass a forest. 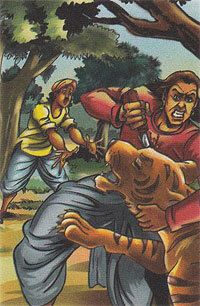 Suddenly a tiger attacked the prince, and Bansi saved his life. After some time, a leopard attacked the prince. This time, Gopi saved him because Bansi was walking ahead. When they returned, the prince told his father what happened. The king rewarded Gopi but not Bansi. Betal asked Vikram "Did the king act justly?" Vikram replied , "The king was just in his actions. He did not reward Bansi because saving the prince was his duty. In fact, he neglected his duty the second time. But Gopi deserve the reward for he did something that was not his duty to perform." Betal said, "You are right . But you spoke, so here I go."